Part of keeping your data safe means backing it up often. Often, site related issues may be resolved by simply restoring your site's data from a recent backup. This article outlines several options for backing up your Media Temple DV. Part of keeping your data safe means backing it up often. Often, site related issues may be resolved by simply restoring your site's data from a recent backup. This article outlines the available options for backing up your Media Temple Grid. There is a 30-day backup restore feature built into the File Manager. If you'd like more information on how to utilize this feature, feel free to check our our article here. Unfortunately there is no built-in back up feature at this time. Therefore we advise creating and maintaining manual backups of your site files/databases. To assist customers with this, we have provided instructions on creating manual backups below. Once you've connected to your domain/server. Navigate to the desired domain and download the websites files. 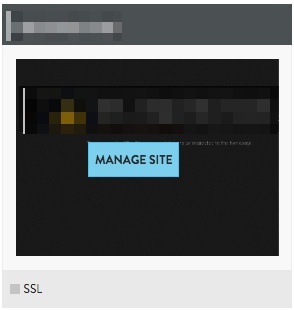 The /html folder and .htaccess file will contain the majority of your websites data. The example below is using FileZilla. Although there are very different ways you can backup your data in a *NIX environment, most choices are based on rsync. The rsync command is a very powerful shell tool that can be coupled with cron to provide an automated backup solution. We suggest looking at the wealth of online resources available for using rsync. Please do NOT keep copies of your database in any of your domain /html directories as that content is accessible to your site visitors. The Snapshot Backup preserves the entire state of your server, from the core configuration files down to the emails. Recommended uses include the following. Complete Backup. This includes customizations to the server configuration, all Plesk data, domains, emails, databases - every single file on the server. Allows you to roll back to an earlier server state, should you have no other available backups of critical data. You can pick and choose what files get restored. Or, you can roll the entire server back to its exact state at the time of the backup. Peace of mind that your backup is safely housed in our Data Center for quick and easy recovery through Plesk. Off-Server Storage - even if your server's host machine fails, your backup will be safe. Create a new backup at any time of your choosing. Hold multiple backups, up to 5, by purchasing additional slots. Each slot costs $20 monthly, and can be purchased via the AccountCenter. For instructions, please read this article: Purchase a Snapshot Backup. You cannot schedule automated backups. It's only one button to click, but you do need to manually click it to make a backup. See Backing up your server using the Snapshot Backup tool for details. You cannot download the backup locally. Due to the large size of these backups (ranging anywhere from 4 GB to 60 GB), they cannot be sent to you. They can only be recovered through Plesk and are not available for direct download. Please see Purchase a Snapshot Backup for details and screenshots. If you are in the Service Provider view (you have a left nav panel), complete the following. 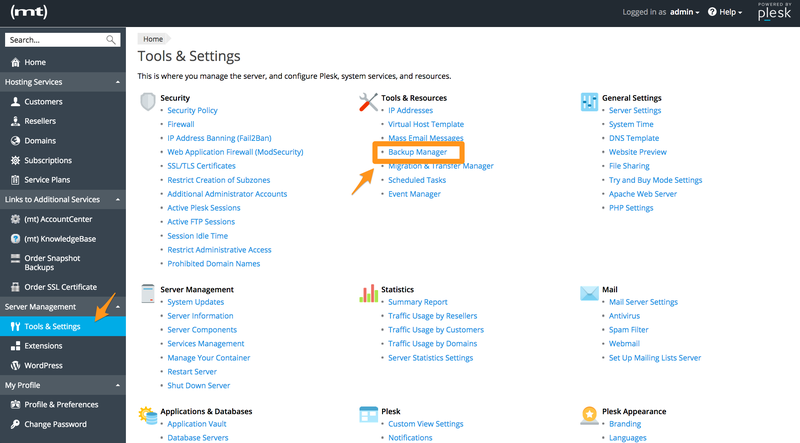 Under Server Management, click Tools & Settings. Under Tools & Settings, click Backup Manager. You can click Back Up or Scheduled Backup Settings, depending on whether you want to do a backup right now or set up a schedule. You can also set up a remote repository to store your data. There are quite a few ways to do batches of backups or single backups. For complete instructions, see the Plesk Documentation. This backup does not back up your high-level configuration files. The files are stored in a special Plesk format, which makes them less than ideal for migrations. See Manually extract Plesk backup files for a possible workaround. You can use WHM to schedule a global backup of the entire server or individual backups for each account. Use the steps below to configure a backup in WHM. From the Home screen, click on Backup. 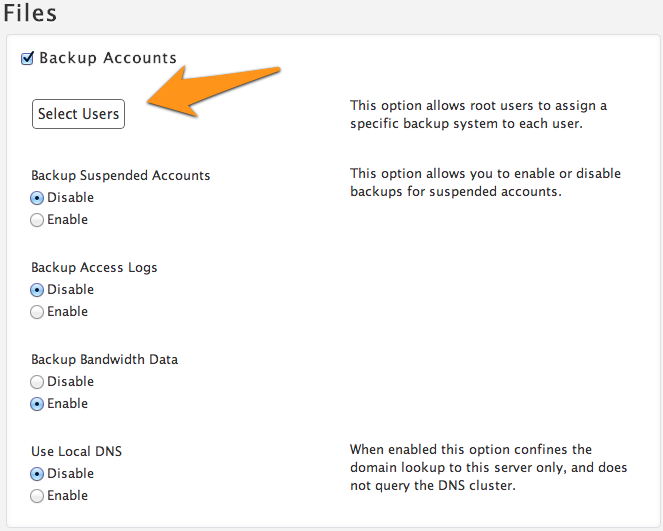 Click on Enable to turn on and start configuring your backups. Choose a backup type and configure a timeout. 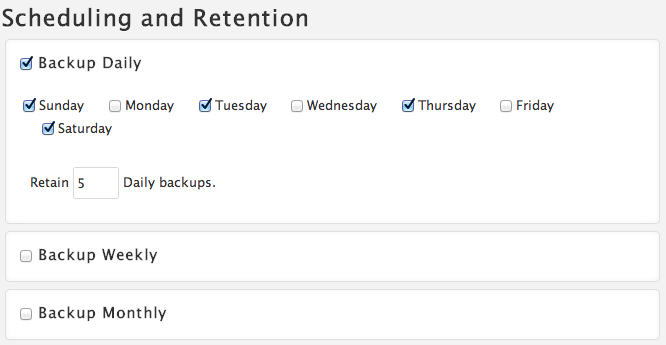 Next, you can set the schedule for your backups and choose how many backups to retain. The next section is where you will choose what you want to backup. You can choose to backup everything or just individual accounts. If you wish to just backup one or two specific accounts, click on Select Users. If you chose to click on Select Users to only backup specific accounts, you will be able to choose to turn on and off backups for each user. If you chose to backup everything, continue to the next step. At this stage you can enable or disable backups for your DV's system files. You will also be able to choose to backup your entire MySQL directory, databases on a per account basis, or the entire directory as well as a per account basis. 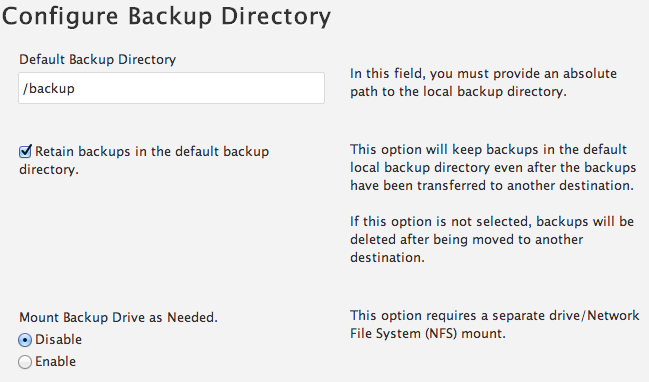 In the next section you can configure the destination(s) of your backups. When everything is configured, click Save Configuration to activate your new backup schedule. Our system maintains regular backups of all customer data for disaster recovery purposes. While we keep these mainly for our own use, we can attempt to accommodate customer requests in the rare case that your own self-managed backups do not contain the data you need. The Emergency Restore service entails a one time payment of $79. Media Temple's Word Press hosting accounts include daily backups for the last 30 days. These backups normally occur around midnight PST. These backups will include your website files and database. Please note that email recovery is NOT included in the Managed WordPress Servers. Email backups will need to be maintained locally by the customers using a third-party application/client. 1. Log in to your Account Center, and select the site that you need to restore. 2. 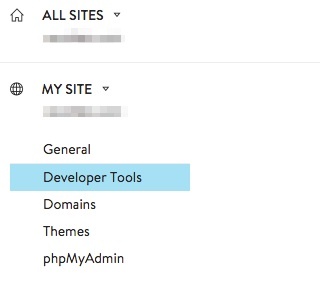 Select Developer Tools from the menu on the left side of the page. 3. 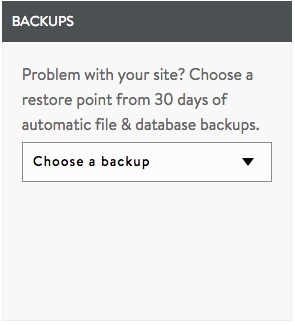 Locate the Backups panel and use the drop-down menu to select the restore point desired from the previous 30 days. A confirmation screen will appear. Click the Restore button again to continue. You will want to ensure that your databases are kept below 1GB in size. Should your database exceed this limit, new backups may stop being generated. Should you notice backup dates missing, and your database size limit is below 1GB, feel free to contact our 24/7 support line by opening a support request, starting a chat, or by calling us at 1.310.841.5500. Once you've connected to your domain/server. Navigate to the desired domain and download the websites files. The /html folder will contain the majority of your website data.